At least 42 people had died, 1,000 more were missing, and some 100,000 were forced from their homes in northeastern Brazil in late June 2010. Torrential rains battered the region for nearly a week, causing floods that likely destroyed entire villages, the BBC reported on June 23, 2010. Floods pushed the River Mundau over its banks near the town of Uniao dos Palmares, leaving 500 people missing, according to local authorities. Elsewhere, floods washed away roads and hillsides. This color-coded map shows rainfall anomalies for the region from June 7 to June 20, 2010. The rainfall amounts for this two-week period are compared to average merged satellite rainfall amounts for the same dates from 1998 to 2009. Observations from multiple sources are calibrated using observations from the Tropical Rainfall Measuring Mission (TRMM). Above-average rainfall amounts appear in green and blue, with turquoise indicating the heaviest precipitation. Slightly below-normal rainfall amounts appear in yellow. A pocket of exceptionally heavy rain occurs near the city of Recife. Areas of heavy rain also occur near the city of São Luis. Image courtesy Hal Pierce and Steve Lang (SSAI/NASA GSFC). Caption by Michon Scott and Hal Pierce. 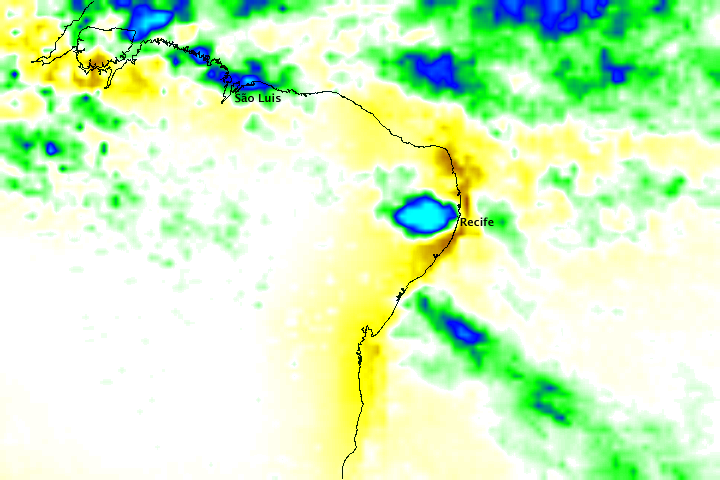 This color-coded map shows rainfall anomalies for northeastern Brazil from June 7 to June 20, 2010. BBC. (2010, June 23). Floods in north-east Brazil kill dozens of people. Accessed June 23, 2010.